An ecological pyramid (also trophic pyramid, eltonian pyramid, energy pyramid, or sometimes food pyramid) is a graphical representation designed to show the biomass or bio productivity at each trophic level in a given ecosystem. Biomass pyramids show how much biomass (the amount of living or organic matter present in an organism) is present in the organisms at each trophic level, while productivity pyramids show the procreation or turnover in biomass. There is also pyramid of numbers which represent the number of organisms in each trophic level. They may be upright (e.g. Grassland ecosystem), inverted (parasitic ecosystem) or dumbbell shaped (forest ecosystem). pyramid of biomass:-The total amount of organic matter present in an organism is called as pyramid of biomass. Biomass can be measured by Bomb calorimeter. An energy pyramid is a presentation of the trophic levels in an ecosystem. Energy from the sun is transferred through the ecosystem by passing through various trophic levels. Roughly 10% of the energy is transferred from one trophic level to the next, thus preventing a large number of trophic levels. There must be higher amounts of biomass at the bottom of the pyramid to support the energy and biomass requirements of the higher trophic levels. The concept of pyramid of numbers ("Eltonian pyramid") was developed by Charles Elton (1927). Later, it would also be expressed in terms of biomass by Bodenheimer (1938). The idea of pyramid of productivity or energy relies on works of G. Evelyn Hutchinson and Raymond Lindeman (1942). A numbers pyramid shows the relevant number of organisms that each trophic level occupies in an ecosystem. Often, there are more producers than consumers, however, it can also be seen in many ecosystems that there are more primary consumers than producers. A "pyramid of numbers" shows graphically the population of each level in a food chain. It is an upright pyramid given in an ecosystem, where usually the producers are more in number than any other Trophic level. This shows the number of organisms in each trophic level without any consideration for their size. This type of pyramid can be convenient, as counting is often a simple task and can be done over the years to observe the changes in a particular ecosystem. However, some types of organisms are difficult to count, especially when it comes to some juvenile forms. Unit: number of organisms. A biomass pyramid shows the total mass of the organisms that each trophic level occupies in an ecosystem. Usually, producers have a higher biomass than any other trophic level, but there can be lower amounts of biomass at the bottom of the pyramid if the rate of primary production per unit biomass is very fast. A "pyramid of biomass" shows the relationship between biomass and trophic level by quantifying the biomass present at each trophic level of an energy community at a particular time. It is a graphical representation of biomass (total amount of living or organic matter in an ecosystem) present in unit area in different tropic levels. Typical units are grams per meter2, or calories per meter2. The pyramid of biomass may be "inverted". For example, in a pond ecosystem, the standing crop of phytoplankton, the major producers, at any given point will be lower than the mass of the heterotrophs, such as fish and insects. This is explained as the phytoplankton reproduce very quickly, but have much shorter individual lives. One problem with biomass pyramids is that they can make a trophic level appear to contain more energy than it actually does. For example, all birds have beaks and skeletons, which despite having mass are not typically digested by the next trophic level. A "pyramid of productivity" is often more useful, showing the production or turnover (the rate at which energy or mass is transferred from one trophic level to the next) of biomass at each trophic level. Instead of showing a single snapshot in time, productivity pyramids show the flow of energy through the food chain. Typical units are grams per meter2 per year or calories per meter2 per year. As with the others, this graph shows producers at the bottom and higher trophic levels on top. When an ecosystem is healthy, this graph produces a standard ecological pyramid. This is because in order for the ecosystem to sustain itself, there must be more energy at lower trophic levels than there is at higher trophic levels. This allows organisms on the lower levels to not only to maintain a stable population, but also to transfer energy up the pyramid. The exception to this generalization is when portions of a food web are supported by inputs of resources from outside the local community. In small, forested streams, for example, the volume of higher levels is greater than could be supported by the local primary production. When energy is transferred to the next trophic level, typically only 10% or 12% of it is used to build new biomass, becoming stored energy (the rest going to metabolic processes) (Pauly and Christensen, 1995). In this case, in the pyramid of productivity each step will be 10% the size of the previous step (100,000, 10,000, 1,000, 100, 10, 1, .1, .01). It takes account of the rate of production over a period of time. Two species of comparable biomass may have very different life spans. Thus a direct comparison of their total biomasses is misleading, but their productivity is directly comparable. The relative energy chain within an ecosystem can be compared using pyramids of energy; also different ecosystems can be compared. There are no inverted pyramids. The input of solar energy can be added. The rate of biomass production of an organism is required, which involves measuring growth and reproduction through time. There is still the difficulty of assigning the organisms to a specific trophic level. As well as the organisms in the food chains there is the problem of assigning the decomposers and detritivores to a particular trophic level. Nonetheless, productivity pyramids usually provide more insight into an ecological community when the necessary information is available. ^ Elton, C. 1927. Animal Ecology. New York, Macmillan Co. link. ^ Bodenheimer, F. S. 1938. Problems of Animal Ecology. Oxford University Press. link. ^ Lindeman, R. L. (1942). The trophic-dynamic aspect of ecology. Ecology 23: 399–418. link. ^ Trebilco, R., Baum, J.K., Salomon, A.K., Dulvy, N.K. 2013. Ecosystem ecology: size-based constraints on the pyramids of life. Trends Ecol. Evol. 28, 423–431. link. Pauly, D. and Christensen, V. 1995 Primary production required to sustain global fisheries. Nature 374.6519: 255-257. Bargarh is a municipality in Bargarh district in the state of Odisha, India. It is the administrative headquarters of Bargarh District . Popularly known for rice cultivation (parboiled-rice) therefore called "Bhata Handi" of Odisha State. An ecological cascade effect is a series of secondary extinctions that is triggered by the primary extinction of a key species in an ecosystem. Secondary extinctions are likely to occur when the threatened species are: dependent on a few specific food sources, mutualistic (dependent on the key species in some way), or forced to coexist with an invasive species that is introduced to the ecosystem. Species introductions to a foreign ecosystem can often devastate entire communities, and even entire ecosystems. These exotic species monopolize the ecosystem's resources, and since they have no natural predators to decrease their growth, they are able to increase indefinitely. Olsen et al. showed that exotic species have caused lake and estuary ecosystems to go through cascade effects due to loss of algae, crayfish, mollusks, fish, amphibians, and birds. However, the principal cause of cascade effects is the loss of top predators as the key species. As a result of this loss, a dramatic increase (ecological release) of prey species occurs. The prey is then able to overexploit its own food resources, until the population numbers decrease in abundance, which can lead to extinction. When the prey's food resources disappear, they starve and may go extinct as well. If the prey species is herbivorous, then their initial release and exploitation of the plants may result in a loss of plant biodiversity in the area. If other organisms in the ecosystem also depend upon these plants as food resources, then these species may go extinct as well. An example of the cascade effect caused by the loss of a top predator is apparent in tropical forests. When hunters cause local extinctions of top predators, the predators' prey's population numbers increase, causing an overexploitation of a food resource and a cascade effect of species loss. Recent studies have been performed on approaches to mitigate extinction cascades in food-web networks. In ecology, energy flow, also called the calorific flow, refers to the flow of energy through a food chain, and is the focus of study in ecological energetics. In an ecosystem, ecologists seek to quantify the relative importance of different component species and feeding relationships. Solar energy is fixed by the photoautotrophs, called primary producers, like green plants. Primary consumers absorb most of the stored energy in the plant through digestion, and transform it into the form of energy they need, such as adenosine triphosphate (ATP), through respiration. A part of the energy received by primary consumers, herbivores, is converted to body heat (an effect of respiration), which is radiated away and lost from the system. The loss of energy through body heat is far greater in warm-blooded animals, which must eat much more frequently than those that are cold-blooded. Energy loss also occurs in the expulsion of undigested food (egesta) by excretion or regurgitation. Secondary consumers, carnivores, then consume the primary consumers, although omnivores also consume primary producers. Energy that had been used by the primary consumers for growth and storage is thus absorbed into the secondary consumers through the process of digestion. As with primary consumers, secondary consumers convert this energy into a more suitable form (ATP) during respiration. Again, some energy is lost from the system, since energy which the primary consumers had used for respiration and regulation of body temperature cannot be utilized by the secondary consumers. Tertiary consumers, which may or may not be apex predators, then consume the secondary consumers, with some energy passed on and some lost, as with the lower levels of the food chain. A final link in the food chain are decomposers which break down the organic matter of the tertiary consumers (or whichever consumer is at the top of the chain) and release nutrients into the soil. They also break down plants, herbivores and carnivores that were not eaten by organisms higher on the food chain, as well as the undigested food that is excreted by herbivores and carnivores. Saprotrophic bacteria and fungi are decomposers, and play a pivotal role in the nitrogen and carbon cycles.The energy is passed on from trophic level to trophic level and each time about 90% of the energy is lost, with some being lost as heat into the environment (an effect of respiration) and some being lost as incompletely digested food (egesta). 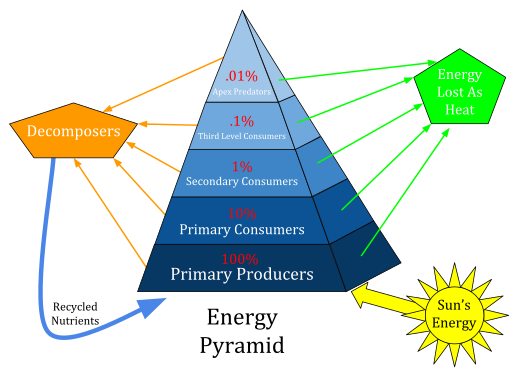 Therefore, primary consumers get about 10% of the energy produced by autotrophs, while secondary consumers get 1% and tertiary consumers get 0.1%. This means the top consumer of a food chain receives the least energy, as a lot of the food chain's energy has been lost between trophic levels. This loss of energy at each level limits typical food chains to only four to six links. This glossary of biology terms is a list of definitions of fundamental terms and concepts of biology, its sub-disciplines, and related fields. For more specific definitions from other glossaries related to biology, see Glossary of ecology, Glossary of botany, Glossary of genetics, and Glossary of speciation. An invasive species is a species that is not native to a specific location (an introduced species), and that has a tendency to spread to a degree believed to cause damage to the environment, human economy or human health.The criteria for invasive species has been controversial, as widely divergent perceptions exist among researchers as well as concerns with the subjectivity of the term "invasive". Several alternate usages of the term have been proposed. The term as most often used applies to introduced species (also called "non-indigenous" or "non-native") that adversely affect the habitats and bioregions they invade economically, environmentally, or ecologically. Such invasive species may be either plants or animals and may disrupt by dominating a region, wilderness areas, particular habitats, or wildland–urban interface land from loss of natural controls (such as predators or herbivores). This includes non-native invasive plant species labeled as exotic pest plants and invasive exotics growing in native plant communities. It has been used in this sense by government organizations as well as conservation groups such as the International Union for Conservation of Nature (IUCN) and the California Native Plant Society. The European Union defines "Invasive Alien Species" as those that are, firstly, outside their natural distribution area, and secondly, threaten biological diversity.The term is also used by land managers, botanists, researchers, horticulturalists, conservationists, and the public for noxious weeds. The kudzu vine (Pueraria lobata), Andean pampas grass (Cortaderia jubata), and yellow starthistle (Centaurea solstitialis) are examples. An alternate usage broadens the term to include indigenous or "native" species along with non-native species, that have colonized natural areas (p. 136). Deer are an example, considered to be overpopulating their native zones and adjacent suburban gardens, by some in the Northeastern and Pacific Coast regions of the United States. Sometimes the term is used to describe a non-native or introduced species that has become widespread (p. 136). However, not every introduced species has adverse effects on the environment. A nonadverse example is the common goldfish (Carassius auratus), which is found throughout the United States, but rarely achieves high densities (p. 136). Notable examples of invasive species include European rabbits, grey squirrels, domestic cats, carp and ferrets. It has been suggested that genetically modified organisms (GMOs) as a class should be regarded and managed as invasive species.Dispersal and subsequent proliferation of species is not solely an anthropogenic phenomenon. There are many mechanisms by which species from all Kingdoms have been able to travel across continents in short periods of time such as via floating rafts, or on wind currents. Charles Darwin, a British naturalist, performed many experiments to better understand long distance seed dispersal, and was able to germinate seeds from insect frass, faeces of waterfowl, dirt clods on the feet of birds, all of which may have traveled significant distances under their own power, or be blown off course by thousands of miles. The mesopredator release hypothesis is an ecological theory used to describe the interrelated population dynamics between apex predators and mesopredators within an ecosystem, such that a collapsing population of the former results in dramatically-increased populations of the latter. This hypothesis describes the phenomenon of trophic cascade in specific terrestrial communities. A mesopredator is a medium-sized, middle trophic level predator, which both preys and is preyed upon. Examples are raccoons, skunks, snakes, cownose rays, and small sharks. The polar bear (Ursus maritimus) is a hypercarnivorous bear whose native range lies largely within the Arctic Circle, encompassing the Arctic Ocean, its surrounding seas and surrounding land masses. It is a large bear, approximately the same size as the omnivorous Kodiak bear (Ursus arctos middendorffi). A boar (adult male) weighs around 350–700 kg (772–1,543 lb), while a sow (adult female) is about half that size. Although it is the sister species of the brown bear, it has evolved to occupy a narrower ecological niche, with many body characteristics adapted for cold temperatures, for moving across snow, ice and open water, and for hunting seals, which make up most of its diet. Although most polar bears are born on land, they spend most of their time on the sea ice. Their scientific name means "maritime bear" and derives from this fact. Polar bears hunt their preferred food of seals from the edge of sea ice, often living off fat reserves when no sea ice is present. Because of their dependence on the sea ice, polar bears are classified as marine mammals.Because of expected habitat loss caused by climate change, the polar bear is classified as a vulnerable species. For decades, large-scale hunting raised international concern for the future of the species, but populations rebounded after controls and quotas began to take effect. For thousands of years, the polar bear has been a key figure in the material, spiritual, and cultural life of circumpolar peoples, and polar bears remain important in their cultures. Historically, the polar bear has also been known as the white bear. In ecology, productivity refers to the rate of generation of biomass in an ecosystem. It is usually expressed in units of mass per unit surface (or volume) per unit time, for instance grams per square metre per day (g m−2 d−1). The mass unit may relate to dry matter or to the mass of carbon generated. Productivity of autotrophs such as plants is called primary productivity, while that of heterotrophs such as animals is called secondary productivity. Sustainable gardening includes the more specific sustainable landscapes, sustainable landscape design, sustainable landscaping, sustainable landscape architecture, resulting in sustainable sites. It comprises a disparate group of horticultural interests that can share the aims and objectives associated with the international post-1980s sustainable development and sustainability programs developed to address the fact that humans are now using natural biophysical resources faster than they can be replenished by nature.Included within this compass are those home gardeners, and members of the landscape and nursery industries, and municipal authorities, that integrate environmental, social, and economic factors to create a more sustainable future. Organic gardening and the use of native plants are integral to sustainable gardening.